Soup's On: A dedicated cook holds a chowder vigil at the annual Clam Chowder Cook Off. 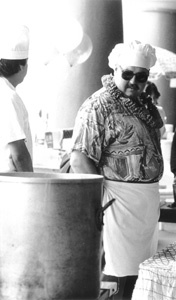 IF I DIDN'T KNOW better, I'd swear some savvy promoter dreamed up the wild and wacky Clam Chowder Cook Off just to give bored Santa Cruzans something to do in the dead of winter. The good news is that most tourists have long since gone back to darkest Fremont and Modesto, and the beach is all ours. And besides, midwinter isn't always cold and rainy, as the entire month of January just proved. It must be the thick broth, all those potatoes and herbs and the chewy bits of sweet, earthy clam. Something has made clam chowder one of America's favorite cold weather mainstays. (There's a point here.) The 20th Annual Clam Chowder Cook Off hits the beach--the Santa Cruz Beach Boardwalk to be exact--this Saturday, Feb. 23. The annual clamathon is free and chowder tasting kits (on sale at 10am, tasting starts at 1pm) are priced at $6 each. There are several kinds of fun happening at the Clam Chowder Cook Off, which I helped judge for more years than anyone cares to remember. There's the fun of watching dozens of teams of "cooks"--hey, some of them are actually professionals, some are gifted amateurs and many are simply showoffs with great attitude and terrific costumes. Armed with their best chowder recipes--either Boston (the thickly creamy kind) or Manhattan (the tomatoey version)--the teams have three hours to slice, dice, season, cook, swear and season a bit more until the judges are turned loose on the results. And there's the fun of tasting your brains out. The public gets to taste right along with the judges--and the variations on chowder can be awesome. Remember the year when India Joze cooks put curry in the chowder? Trust me, you'll sample versions of clam chowder that actually taste nothing whatsoever like clam chowder as we know it. Total fun. And where else can you watch grown men and women cooking while dressed up as carrots, artichokes, pirates, hula dancers and (my favorite) giant clams? Only in Santa Cruz. You can't afford to miss this culinary silliness. Rarely do I use the expression "fun for the whole family," but I'm using it now. And it'll remind you just how great the beach is in the winter. You know where the Santa Cruz Beach Boardwalk is. Aim your car there this Saturday--and enjoy the clammy thrills. For details, call 423.5590. Just got off the phone with Kelly Porter Sanchez, founder of the delectable Kelly's Bakery, who confirms that yes, the new, expanded West Side Kelly's will be opening "this summer." Permits and reshuffling of plans and ideas slowed things down a bit, Sanchez admitted, but she and husband, Mark, are looking forward to being proprietors, "like in the old days, when we were a gathering spot with a sunny courtyard for coffee." Stay tuned. Ethan and Greta Hamm, the longtime entrepreneurs of Theo's and founders of the area's first alternative dining spot, the late great Ark of Capitola, have decided to retire after 30 years in the food biz. New owners Roger Romano (a longtime Theo's patron) and Ed Blackman intend to keep everything the same for the bistro's discerning fans, Greta told me. Chef Nikki Tripp currently creates the great flavors at the tiny cottage that is the last reminder of Soquel's dining glory days. The end of an era any way you slice it.